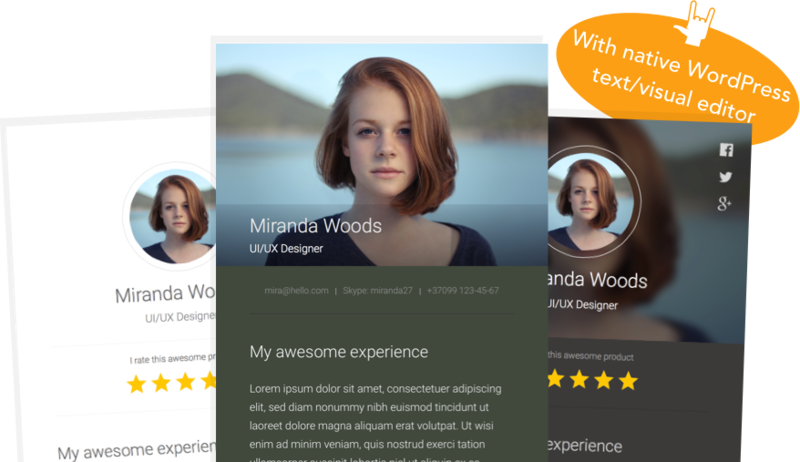 Meet the most beautiful and flexible testimonial showcase for WordPress. Excited! 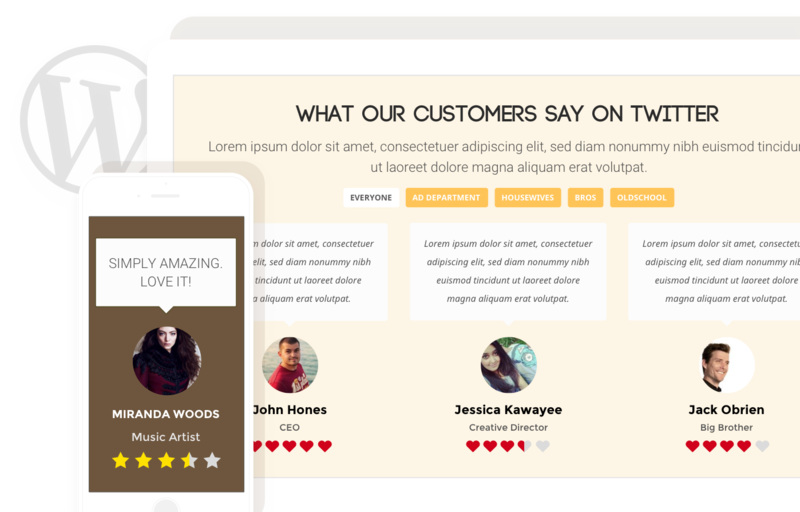 Testimonials by Looks Awesome is beautiful, powerful and user-friendly WordPress plugin. You can expect ton of options to customize design and behavior of your testimonials showcase. Pickup one of predefined templates. Use as is or DYI own testimonial showcase. Bored of star icons? Make your design fresh and fun by choosing icon from library or add your own! Turn On/Off any element of testimonial, re-arrange blocks with drag&drop and style. Awesome! Responsive layouts look great on any device screen size. Choose your testimonial group by name with Visual Composer and you’re ready to go. Collect reviews from your visitors and approve them from admin panel. Include meta information and Google will ❤︎ you. Stand out of the crowd on search engine results. Choose to display author/brand info with sliding panels. Html/visual editor is included! Packed with all the necessary features! Sorting, filters, sliders and more. Are you interested? Purchase right now! Or keep scrolling to learn more. Excited!  plugin is easy to manage your testimonials, groups and style them on the fly. Drag & Drop interface allows to create new group layout and craft unique design for them very quickly. 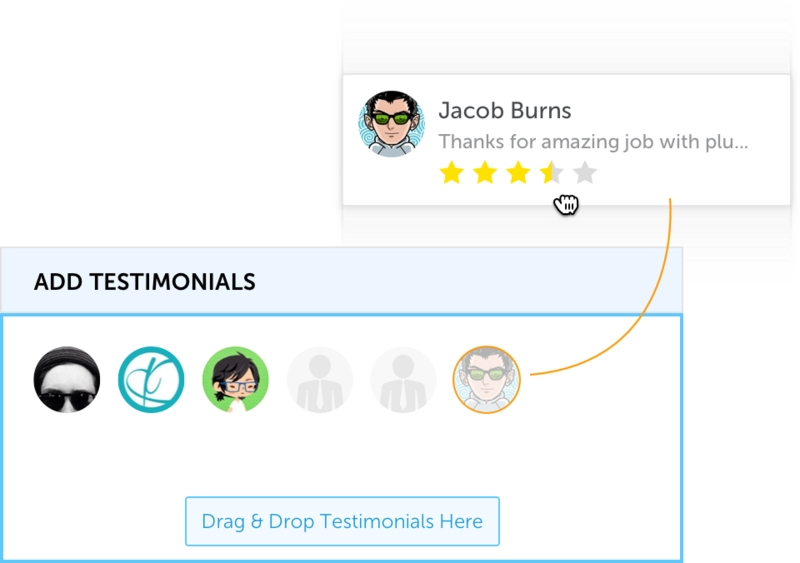 Just drag and drop testimonials to all groups you need. Then place shortcode on your page and that’s it! Open full review in amazing sliding panels. You can even style it as you wish with built-in WordPress rich editor. There are 5 design templates packed in plugin. Imagine you can use any icon instead common star sybmbol to display rating. Pick up one from the icon library or add your own. Awesome! Select size, color or re-arrange rating icons to build new testimonial layout. Free version of Excited! Testimonials is available for download. Give it a try and switch to PRO when you are ready for advanced functionality. Various design layouts and templates. Powerful drag and drop admin builder. Svg icon library for rating icons. Fancy mouse over and revealing effects. Slider autoplay with time interval. Submission form with approval system. 1-5, 1-10, 1-100 or icon rating systems. With the admin builder you get unbelievable freedom on design customization. Basically it’s possible to craft any layout because you can both style and re-arrange any blocks. Don’t forget to check live demo page for a live test of this plugin to get a feel for its functionality.